I am 53, married, 4 children and a dog! I support the Oxford Cheetahs and have followed them since my first meeting in 1959, my dad was a big Cheetahs fan having followed them since they joined the league in the late forties. He also attended meetings at the stadium pre-war, when open meetings were staged. I still follow the sport although since the demise of Oxford, have not switched my support preferring to take a neutral view and just enjoy the racing. I remember Ron at NO 1 for the Cheetahs in 1964 and a great exponent at the art of team riding, especially when paired with Jimmy Gooch, unfortunately Ron broke his shoulder in 1965 while racing for GB V Russia I believe, and subsequently retired. Just the best of the best undeniably THE greatest rider to wear an Oxford race jacket. Individualy brilliant, a fantastic team man, how else can you describe the great man. Hans could always get the best out of everyone, or so it appeared, especially his riding partner, Per Sorensen being one who springs to mind, after being released by Swindon, Per upped his average assisted by Hans and won the league title with Oxford. Arne was the first Great Dane who never fulfilled his true potential due to an injury (fractured skull), but a great team man who for many seasons was a main stay ofthe Oxford side. 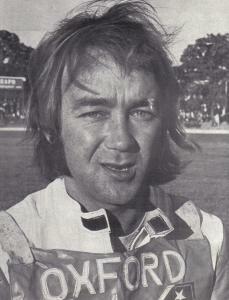 Although never an out and out No1 at Oxford he was a good team man and a brilliant all round motorcyclist. Simon always had time for the fans and was very innovative many of his ideas leading to what we see on track today. Only rode one full season for Oxford but was on fire that year toping the averages for Oxford, that year me and two mates followed Yeatesy all round the country and got to know him personally, a nice bloke! Fred was a mainstay of the Oxford team, I got to know him as a boy of twelve when I used to go to his workshop at the stadium 5 days a week watching him prepare his bike. I also remember being asked by June Briggs (Barry's wife) would I still support Fred if he moved to Swindon? Not a chance, once a Cheetah, always a Cheetah was my reply. A brilliant individual and team man, led from the front in Oxford's last league title win, like Hans, always seemed to be able to coax a little more out of the lesser lights.